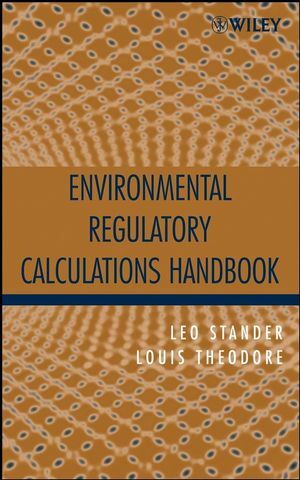 Regulatory Calculations Handbook addresses the environmental concerns of individuals by presenting the basic fundamentals of many environmental regulatory topics. Featuring an overview of the history of environmental problems, the current regulatory framework, and problems/solutions of practical problems in the field, this handbook comprehensively brings the potential calculations and information on regulations into one single-source reference. Leo Stander is an environmental engineering consultant specializing in air quality strategy development, air pollution permitting, and training. He has over thirty-five years of experience in the air pollution field, including over twenty-two years with the U.S. Environmental Protection Agency's Office of Air Quality Planning and Standards. Louis Theodore, PhD, is Professor in the Chemical Engineering Department of Manhattan College in New York, a contributor to Perry's Chemical Engineers' Handbook, and coauthor of Introduction to Hazardous Waste Incineration, Second Edition and Handbook of Chemical and Environmental Engineering Calculations (both from Wiley). He received the International Air and Waste Management Association's prestigious Ripperton Award and the American Society for Engineering Education's AT&T Foundation Award for "excellence in the instruction of engineering students." 2. Current Environmental Regulatory Framework. 3. Clean Air Act (CAA). 4. Clean Water Act (CWA). 5. Safe Drinking Water Act (SDWA). 6. Resource Conservation and Recovery Act (RCRA). 7. Toxic Substances Control Act (TSCA). 8. Comprehensive Environmental Response, Compensation and Liability Act (CERCLA-SUPERFUND). 9. Occupational Safety and health Act (OSHA). 10. Pollution Prevention Act (PPA).